One by one speakers told committee they preferred two acute care hospitals. 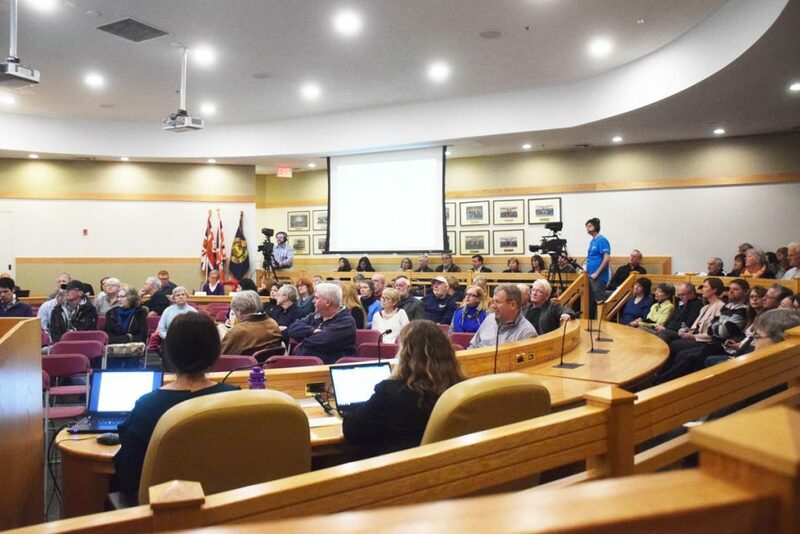 Keep two fully functioning acute care hospitals in Bracebridge and Huntsville – that was the message the 16 speakers delivered to the board and administrators of Muskoka Algonquin Healthcare (MAHC) and the Capital Plan Development Task Force at a public meeting last night. The task force was appointed by the board of MAHC to examine and make a recommendation on a future hospital model. That recommendation is expected sometime this spring. 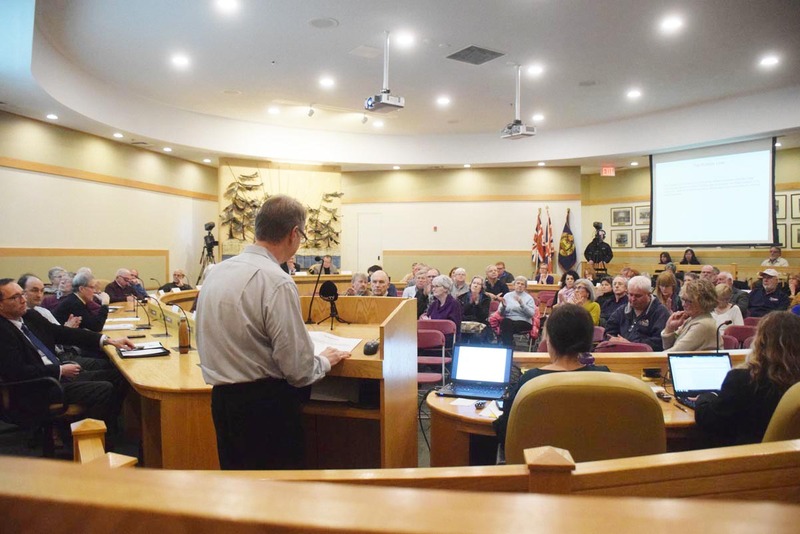 In the meantime, the task force held a community meeting at the District Municipality of Muskoka council chambers in Bracebridge on Thursday to gather input from the community. He called for a major redevelopment of the two sites, which he said can be done in phases according to future changes in health care and community needs and current travel times for emergency care will not be impacted. Concerns with distance and travel times worried many who spoke that evening. Bella Lake resident in the Township of Lake of Bays, Mary Spring, provided those present with a personal anecdote. She said her husband had required major surgery at Toronto General Hospital. He was released last weekend and a complication occurred and he required emergency treatment. “My brother-in-law and I decided to take Don [her husband]to the Huntsville hospital truly believing that time was very, very important. The trip along Limberlost Road and Highway 60 was nail-biting, but we made it. We sincerely appreciated the excellent care that Don received from the doctors and nurses in Huntsville. I don’t even want to think what could have happened if we had had to drive to Bracebridge,” she said. The economic impact of taking a hospital out of a community was also top of mind for many who spoke, citing job loss, a decline in per capita income, businesses relocating closer to hospitals as well as doctors, specialists and ancillary health care service providers in need of diagnostic equipment to practice their field also leaving the community and relocating closer to a hospital. “There is absolutely no doubt in my mind that most people and businesses considering a move to a community would prefer and choose that same security of a fully active acute care facility. If our town loses its hospital, not only will our community members suffer, our economic well being absolutely suffers too,” said Jenny Kirkpatrick, the wife of a surgeon at Huntsville hospital, a hospital which she also attributed to saving her life. She urged the board and task force to be more transparent, as others did that evening, and to take a close look at maintaining two acute care hospitals in the community, rather than building a new one somewhere in-between. “It probably seems cheeky of me to be asking for comparative studies of potential costs, when you have already told us it’s too expensive but I, and I am not alone, haven’t always thought that you have listened respectfully or been entirely upfront with us.” She backed up her argument by noting that meetings held in the past have often been poorly advertised and held when many in the community were on holiday. “And where there’s poor attendance, it allowed you to assume there wasn’t interest. You’ve had meetings where you presented your ideas and then did not permit open questions from the floor, instead we were directed to various substations so that not everyone was in the same conversation,” she said to applause. Kirkpatrick and others suggested that the deamalgamation of the two hospitals should be considered. Former politician and Lake of Bays resident Dan Waters, who said he now lives in Bracebridge, asked why the same question is still being asked about the future of hospitals in the community. “There is no doubt that one site is a fixation with this group,” he said, suggesting that perhaps the hospitals should disband MAHC and go back to having their own boards. “We no longer have a public board that represents people of our area. People are vetted first to make sure they agree with the current direction of the hospital executive, which is one site not the status quo,” said Waters, who noted that most of the administration lives in Huntsville and suggested that Bracebridge would lose their hospital. 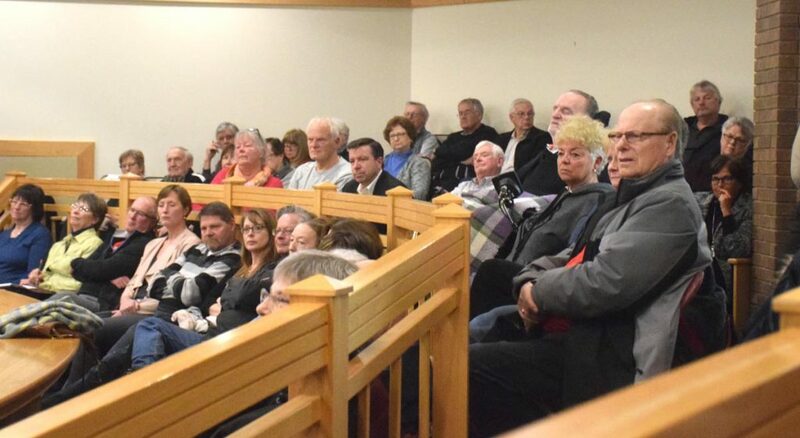 Others, like Bracebridge resident Bruce Kruger, who said he has family in both communities, ultimately suggested that if two hospital sites cannot be maintained, then the location should be Bracebridge, to jeers from some of those present. David Wilkin, a retired Huntsville resident and past hospital board member, reminded those present that “fundamentally if we divide, we lose. If we stand together we win,” to applause from those present. Wilkin compared MAHC to six other hospitals also vying for new capital funding. He looked at six other areas and said the average age of those hospitals are well above the average age of hospitals here. He also compared growth rates and the amount of money being asked of the Province, which he said puts MAHC at a disadvantage. You can find his analysis here. He also urged the community to come together and urge the Province to properly fund medium-sized hospitals. “Let’s not hide behind the funding formula as a reason that we can’t have two hospitals. It’s nonsense,” he said. Ontario Health Coalition Executive Director Natalie Mehra also spoke to the task force saying the drive to replace two hospitals with one hospital will result in cuts to global funding and actual cuts to services. You can find more information about the organization here. The 16 speakers came from various locations and backgrounds and task force chair Cameron Renwick said he was pleased with the turnout. He also said the 40 written submissions would be compiled for the task force’s review. The meeting was supposed to be webcast, but there were technical difficulties with the sound. Renwick said people could view the archived footage of the meeting here. “The task force I believe has listened and we are going to certainly take all the comments back and I believe everyone will spend the time that we need to contemplate all that’s been told to us,” he said. Well over 100 people including MAHC board members and administrators as well as members of the Capital Plan Development Task Force attended the public meeting, but there was still room for more. A huge thank you to those who took the time to make a presentation, to submit a written comment and to attend the public meeting. The oral presentations were eloquent, thoughtful and heartfelt. Let’s hope the task force and the Board were listening. It’s not too late to submit your opinion in writing to the Task Force. There have been at least 44 written submissions so far. I would ask that the Task Force read over the written submissions and release a summary to the public. Not just a list of FAQs as was mentioned last night but a summary of all the written submissions along with the data from the surveys that they have conducted within the region. I also would like to thank the people who went to this meeting to fight for our hospital. As i havnt got a car i couldnt go. But i am thankful that these people made it a priority to go to the meeting. Thank you Doppler for having this complete review of the meeting in Bracebridge, concerning our hospitals. There was no doubt that the one option for Muskoka is to have two full care hospitals. Why do you keep asking us what we want when it is clear , we do not want to lose our hospital. Some interesting facts are that amalgamation will not save money but indeed would cost more with likely less service. I am sure if this meeting were held in Huntsville we would have filled all the seats as there is a definite feeling here that Bracebridge is favoured for a one site facility. There was only one presenter who, although he preferred two sites, did think Bracebridge would be best for a new hospital. Thank you to all the presenters , who were so completely prepared with graphs and data proving two sites would be best. With the 2 site solution you will be having these type of discussions FOREVER… ie funding, services, expansion, old equipment, old buildings, etc etc. I truly believe the money holders are firm about a one NEW hospital solution and when you look at the just the 2 hospital cost maintenance structure it does not carry any wait or make any sense. When you look at trying to carry the cost for current services it does not make sense and if you think you are going to get each hospital maintained with identical future services, future staff requirements, new future equipment requirements etc etc .. it will not happen .. and .. you will see funding go some where else .. not Muskoka! WE ..all of us ..will be stuck in a time warp and I really believe we are being selfish and ALL have short term thinking and not thinking long term of future residents, demographic expansion, area expansion etc etc. Much better to work with the money holders than fight them and have a new uptodate hospital that will get the appropriate for future funding, new services etc etc … otherwise it will continue .. MUSKOKA stuck in a time warp! Thank-you to the people who took the time and made the effort to go to the meeting and to speak their minds. We need to get feed-back from the Ministry of Health…they are being vague about their intentions…are they willing to adequately fund us so that we can operate both sites effectively or do they intend to “starve us into submission”? It is interesting that if we went to one facility, the government’s financial health care transfers to this area would decrease along with service, however our income taxes and the Ontario Health Premium that is tacked on to our income tax returns each year would not drop by one penny. The economic welfare of our respective towns is not only an economic issue, but also a health issue because it has been proven that economic security and satisfactory incomes are directly related to health outcomes. About 2 years ago The HUB facilitated a group of private health innovators with a great idea about how to improve local health care – most of us represented private mental health, however there was also alternative health included. We met with local Physicians, health admin, municipal and regional representatives. We presented our ideas to all those attempting to improve the local health system, which we thank for providing us the time! We called ourselves the IWP, or the Integrated Wellness Project. Our vision is to have a limited integrated public and private health system to fill gaps and reduce redundant services, and quite simply make the health system more streamlined and simpler to understand. We supplied an example in Ontario of a very similar project being completed in Dundas with the Hamilton Health Team. Our ideas have shown to work in Ontario! Unfortunately we feel the old school ways of thinking dominated our vision, overshadowed by the inability to see past the ‘norm’. Now as we fight to keep 2 hospitals in Muskoka, our health system continues to stay segregated between public and private. In these time when you try to get health care you wait for hours for someone to look at you!!! The Provincial Government doesn’t care about this they only care to save money they can frivolously can spend somewhere else instead of help those taxpayers that need medical care. We don’t need ONE HOSPITAL and still not be able to get care that we need, but TWO functional hospitals that can give the proper coverage to their areas with proper FUNDING to achieve proper care for those in medical need !!! Get your Political Heads out of your BUTTS !!! An angry and concerned Taxpayer !!! !